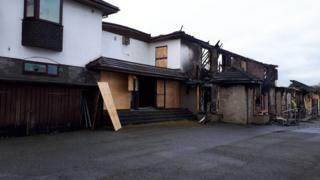 Firefighters tackled a large blaze at a disused hotel in Pembroke Dock. Mid and West Wales Fire and Rescue Service was called to the former Cleddau Bridge Hotel on Essex Road at 02:49 GMT. The fire had spread across the ground and first floors and into the loft space. There have been no reports of injuries. Six crews remain at the scene and are damping down. Dyfed-Powys Police officers also attended. David Hancock, from the fire service, said a large part of the building had been "significantly damaged". He told BBC Radio Wales: "It is unoccupied but we understand it was undergoing some form of redevelopment. "Half of the northern side has been significantly damaged." An investigation into the causes of the fire will begin later, the fire service added.